(Nanowerk News) A research group in Canada has introduced a new approach to enhance perovskite nanocrystal (PNC) stability through a class of intrinsically crosslinkable and polymerizable ligands. As they report in Advanced Materials ("Chemically Addressable Perovskite Nanocrystals for Light-Emitting Applications"), the team shows that this enhances PNC surface passivation, and simultaneously provides high film conductivity and optical homogeneity for optoelectronic applications. The ligands contain styryl groups, which are a convenient chemical handle for crosslinking via heat treatment and a radical initiator or polymerization with other monomers using radical-based methods. Well-balanced charge injection and efficient radiation recombination in the active material are key parameters for high-performance LEDs. The strong correlation between material properties and device performance is also valid for perovskite-based devices, where the exciton dissociation in the emissive material (i.e., perovskite crystalline film) is much more favorable than other materials (e.g., quantum dots and semiconductor organic molecules). 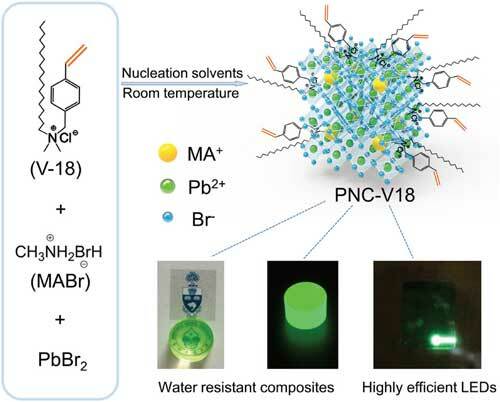 However, While PNCs have exceptional luminescent properties, their widespread application is hindered by their low chemical and colloidal stability. In the team's new approach, the synthesis of PNCs does not use high-boiling-point solvents (such as octadecene), excess stabilizing agents (such as oleic amine or oleic acid), heating, or inert gas protection. The obtained PNCs possess homogeneous morphology and high photoluminescence quantum yield. Furthermore, the PNCs can be copolymerized with styrene and methyl methacrylate to obtain homogenous hybrid materials that have excellent resistance to water. As a proof of concept, the researchers demonstrate the application of their crosslinked PNCs in light-emitting diodes (LEDs). They report that the best device exhibits a maximum luminance exceeding 7000 cd m-2, over 300% better than previous reported MA-based PNC devices. "This work shows that ligand design is of utmost importance for materials’ stability and device performance," the authors conclude. "This appears to be a very promising approach toward high-performance and stable PNC LEDs and should be broadly applicable to other perovskite optoelectronic devices including solar cells, photodetectors, and lasers, where stability issues hinder the widespread use of these technologies.